With the latest iPhone software update, version 3.1, the long awaited augmented reality applications finally have arrived on the iPhone platform. Already a month back acrossair’s Nearest Tube application was hyped on the net and in the news, but now it rather quietly was introduced. It featured on the blog before here. It is now available on the itunes app store for £1.19. I wonder how a software price of 1.19 is calculated? Together with it came a bunch of similar public transport applications for example the London Bus application for £ 0.59 by presslite. Of course both developers cover a range of cities with their apps, where you have to by the app for each city separately, of course. Presslite does cover, London, Paris, Berlin, Lyon, Moscow, Washington, Marseille, Tokyo, New York, Chicago, Montreal, Toronto, Madrid, Amsterdam, Beijing and Hong-Kong. Acrossair on the other hand covers New York and London. I can imagine that it is a battle over this field, as potentially there are a lot of customers. It is for the commuters, but also for tourists and then it is for everyone else who is in the city. I guess that the companies assume that nearly everyone needs their app. I don’t think it is that simple, though. For one, not everyone has the gadget to actually use the software and two; the idea of getting lost in the city is a myth. The believe that everyone in the city needs this sort of navigation aid is based on the idea that no one knows their way round and constantly get lost. Well, in a large city such as London it is impossible to know every corner, but I believe that people know their daily route quite well and are perfectly capable of navigating along familiar trails. Only when it comes to out of routine activities on unfamiliar territory navigation aids are use. For example in most cars here in London you can spot an A-Z on the back seat. However, back to the functionality of the applications, the Nearest Tube works beautifully, it is as simple as it gets, both, in terms of graphics and functions. You tab the icon it opens and shows as a camera overlay the direction to the tube stations. The only thing you have to confirm is an iPhone operating system specific question, because the program wants to use the location information to locate the position, so the user has initially to confirm that the software is allowed to do so. Other than this there is no button, no developer logo, no info or about, nothing – how nice! You can, however, tab on the displayed tube sign and it will take you to Google Maps and shows the direct route to get there. It is a five star application; it does what it is meant to do and nothing more. The London Bus on the other hand, does not convince at this stage. It claims to give you bus route information in London, but actually it is limited to central London and to a fraction of the bus lines and only covering major bus stops. Those are basically the tube stations. Although there are a number of bus stops on Tottenham Court Road it directs you either to Tottenham Court Road Station on the South end of the road or to Warren Street Station on the North end of the road. Out side the centre, I tried to use it to get in to work this morning around Tufnell Park; the software would not even register the location and therefore not even give information about distant stations. 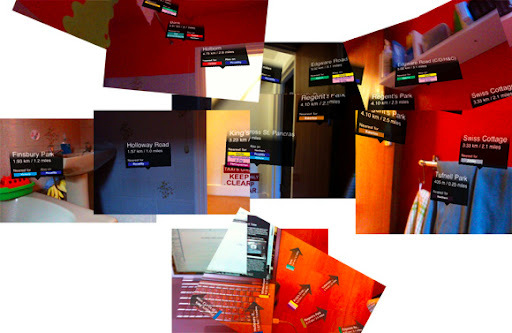 It also features Augmented Reality but only as an additional visualisation, where as Nearest Tube only builds on AR. London Bus is map based with the option to use AR and it is not as neat as the acrossair version. So Nearest Tube is cool, London Bus is not so cool.